Join us on November 4th to launch the latest spooky edition to our Recovered Voices series. The Unforeseen by Dorothy Macardle will be launched as part of the Dublin Book Festival in the Gutter Bookshop at 6.30pm, with a reading by special guest Elske Rahill. This follow-up to the critically acclaimed haunted-house novel The Uninvited is a sharply observed account of pre-World War II Dublin, as well as a darkly prophetic forecast of things to come. 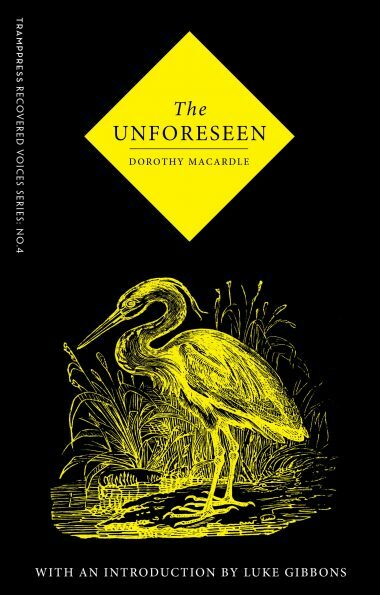 The Unforeseen reaffirms Macardle as Ireland’s answer to Shirley Jackson. The launch is free and all are welcome, and there will be wine! DOROTHY MACARDLE (1889-1958), an Irish novelist, playwright, journalist and historian, was born in Dundalk in 1889 to a wealthy brewing family, and educated at Alexandra College and University College, Dublin. A Republican and member of Cumann na mBan, Macardle was imprisoned for her activities during the Irish Civil War, and later worked as a journalist with The Irish Press. Her monumental history, The Irish Republic, was published in 1937, and her account of the plight of children in war-torn Europe, Children of Europe, in 1949. Her plays were produced at the Abbey and Gate theatres, and among her works of fiction are Earth-Bound: Nine Stories of Ireland (1924), Uneasy Freehold/The Uninvited (1942, and republished by Tramp Press in 2015), and Fantastic Summer/The Unforeseen (1946). She died in Drogheda in 1958.